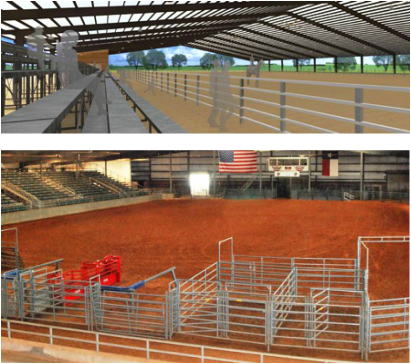 This 96,000 square foot, first-class, indoor covered arena at the Texas Horse Park will host amazing equestrian events and large scale parties! The location is ideal for any kind of a "good time". With fantastic food and refreshments available, your guests will be ready for the competition, show or festival! Contact us at 469-804-2660 or mail to: info@RiverRanch-TexasHorsePark.com and get something booked while available dates remain! River Ranch at Texas Horse Park offers exclusive opportunities for marketing and branding. From facility naming rights to corporate signature events, THP is the ideal platform for sponsors to deliver their messages. The money obtained from these sponsorships will be used to support our charity’s services for the underprivileged and those with special needs. It will also be used for facility improvements, animal care and promotions to keep our movement strong. To request an information packet on corporate sponsorships, click on the button below, can call 469-804-2660 or mail to: info@RiverRanch-TexasHorsePark.com.